TV features making their Samsung debut include HDMI 2.1 capabilities, sound that automatically compensates for room acoustics and viewing distance, the Apple TV app, and more. 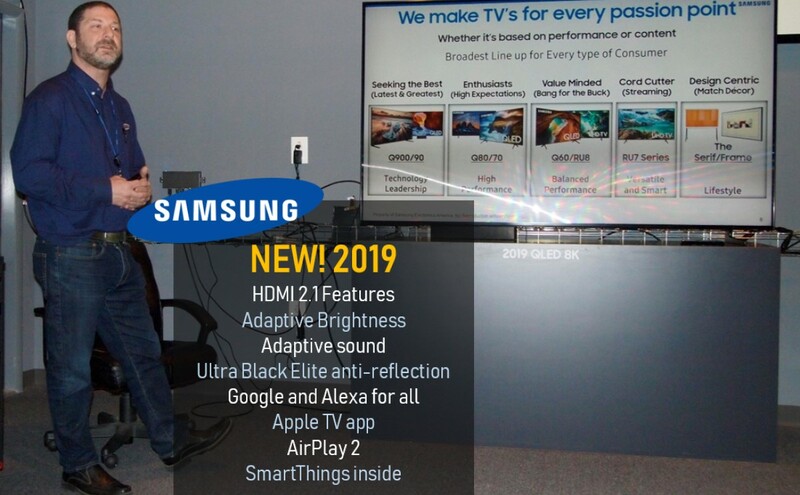 Key HDMI 2.1 capabilities are making their debut in Samsung’s 2019 4K and 8K TV lineup along with other new features ranging from sound that automatically compensates for room acoustics and viewing distance, brightness that automatically adjusts to ambient lighting conditions, and voice control through Google Assistant and Alexa-enabled smart speakers. The features are showing up in a 2019 portfolio that also notable for an expanded selection of 4K and 8K TVs, more SKUs with screen sizes of 75 inches and up, more models with contrast-enhancing full array local dimming (FALD), and the expansion of Samsung’s Bixby virtual assistant to more TVs. With the retail rollout of its lineup, Samsung has added 75-inch or larger sizes to its 4K RU800 series and to all four Q series of step-up 4K quantum-dot QLED TVs. The entry-level 4K RU7100 series also adds a 75-inch model. 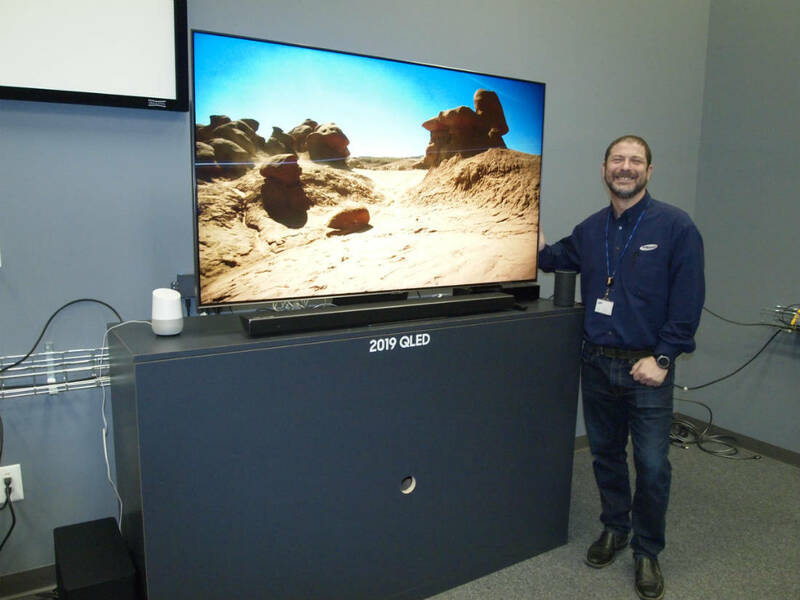 And the Q900 8K series, which featured a single model at 85 inches in 2018, adds the 65-, 75- and 82-inch sizes, with a 98-inch model to come sometime later this year at an unannounced price. 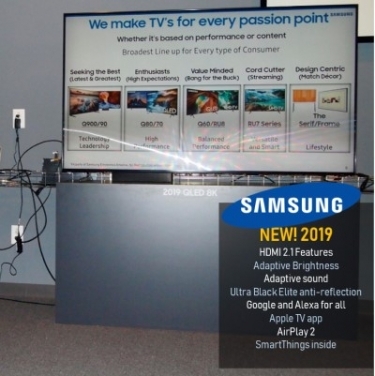 Scott Cohen, Samsung’s senior manager for home entertainment training, outlined the advances in detail during a press event Thursday at the company’s Quality Assurance Labs in Pine Brook, N.J. The 2019 lineup consists of the 4K entry-level RU7100 series and its curved-screen RU7300-series offshoots, the 4K RU8000 Premium UHD series, four series of QLED quantum-dot TVs (Q60, Q70, Q80 and Q90), and an expanded 8K Q900 series, which likewise features QLED technology. The décor-focused Frame and Serif lines also come with QLED panels. All are smart TVs. All 4K and 8K TVs except for the 4K entry-level RU7100/7300 series feature an on-screen SmartThings dashboard to control compatible smart-home products when a Samsung SmartThings Hub is purchased. Only a handful of smart-home devices can be controlled through the TV without the hub, Cohen said. Samsung didn’t announce the pricing or availability of its two latest modular 4K MicroLED TVs in 75- and 219-inch screen sizes. They were unveiled at CES and will join a current 146-inch 4K MicroLED TV. In HDMI developments, Samsung has forged ahead with HDMI 2.1 features in 4K and 8K TVs even though the HDMI Licensing Administrator (LA), which licenses HDMI technology, hasn’t released compliance-testing specifications for all HDMI 2.1 features. 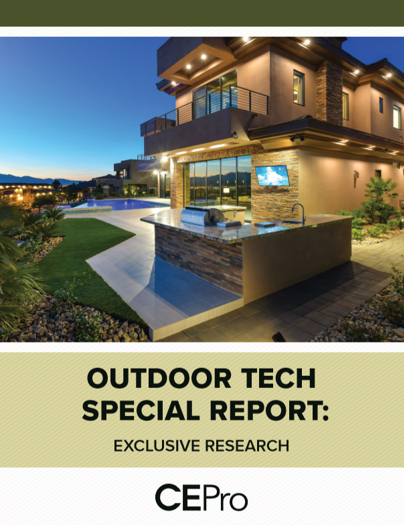 To date, “features supported in the CTS so far are eARC [enhanced Audio Return Channel] and the connectors, and that’s all that can be tested and certified,” he said. 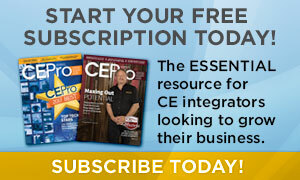 Only a “handful” of certified eARC AVRs and “a few” eARC sound bars are on the market, he noted. In the 2019 TVs, the number of HDMI 2.1 features increases as you step up through each TV series. The entry-level RU7100/7300 series features auto low latency mode (ALLM) for responsive gameplay. The RU8000 series adds dynamic metadata and, for gamers, variable refresh rates. The Q60, Q70, Q80, Q90 and Q900 series boost frame rates to 120fps for 2K and 2.5K content, and the Q90 and 8K Q900 series boosts 4K frame rates to 120fps. The 8K series also supports 8K at 60fps through its HDMI inputs. 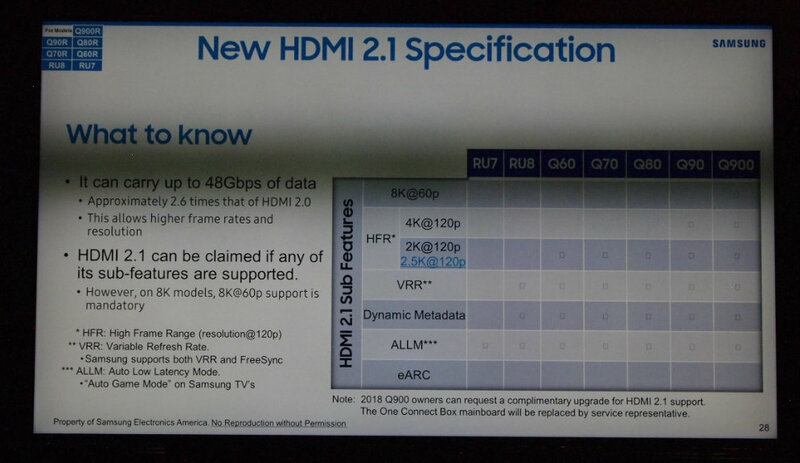 The Samsung TVs, however, don’t support HDMI 2.1’s eARC (enhanced Audio Return Channel). In Samsung’s estimation, eARC isn’t needed because smart-TV streaming services are delivering immersive Dolby Atmos metadata via Dolby Digital Plus soundtracks, Cohen said. These soundtracks pass through a TV’s standard ARC output to ARC-equipped AVRs and sound bars. That’s adequate for most Samsung customers interested in immersive sound, he said. The number of HDMI 2.1 features expands as you move up Samsung’s TV lineup, with the entry-level RU7100/7300 series offering auto low latency mode (ALLM), the 4K Q90 and 8K Q900 series boosting 4K frame rates to 120fps, and the 8K series supporting 8K at 60fps. Samsung has added several new features to its 2019 lineup, including adaptive brightness, adaptive sound, Ultra Black Elite anti-reflection technology, and more voice-control options. Adaptive brightness automatically adjusts TV brightness according to ambient room lighting levels and maintains accurate tone mapping. Samsung’s 4K and 8K quantum-dot TVs (including the 4K Frame and Serif) automatically dim in dark rooms when scenes are bright, and the displays brighten up in rooms with high ambient lighting levels, Cohen explained. Sound also gets adaptive in all 4K and 8K TVs, including the 4K Serif and Frame TVs. Samsung turned to artificial intelligence (AI) to automatically optimize sound on a scene-by-scene basis depending on whether the scene features dialog, music or special effects. The TVs also calibrate sound automatically to compensate for room echoes and reflections as well as for viewing distance. For those functions, Samsung equipped the TVs’ remotes with far-field microphones that detect test signals emitted by the TVs. Also for better viewing, Ultra Black Elite anti-reflection technology debuts in the 2019 line in the Q80, Q90 and Q900 series, reducing glare for better daytime viewing and improved black levels. The panels in these models also deliver “ultra-wide” viewing angles so that colors aren’t washed out at extreme viewing angles. In expanding voice-control options, Samsung is making all 4K and 8K TVs compatible this year with Amazon Alexa and Google Assistant smart speakers. The company added the options because of the high penetration rate of the smart speakers and consumer demand for Samsung-TV compatibility, Cohen said. With Bixby, consumers can tell their TV to search for specific movies and TV programs, search for movies by genre, and even ask for a list of available top-grossing films in a particular year or movies featuring a particular actor. Voice commands implemented by Alexa and Google Assistant are limited to turning the TVs on and off, but consumers who want voice control over more TV functions can turn to a TV’s built-in Bixby virtual assistant, Cohen said. Bixby appears in more TV SKUs this year, with all 4K and 8K TVs getting Samsung’s virtual assistant except for the opening-price 4K RU7100/7300 series. With Bixby, consumers can tell their TV to search for specific movies and TV programs, search for movies by genre, and even ask for a list of available top-grossing films in a particular year or movies featuring a particular actor, Cohen said. Technology from rival Apple is also turning up in Samsung TVs. The Apple TV app, due in the spring as an update, accesses a variety of streaming services, including Apple’s planned Apple TV+ original-content service. Apple AirPlay 2 enables screen Wi-Fi mirroring from Apple devices without the need for an Apple TV box, joining Android-device mirroring. The Apple TV app and AirPlay 2 come to all 4K and 8K TVs, including the Serif and Frame TVs. Other key features that Samsung is expanding to more TV SKUs include full-array local dimming (FALD), which appears in four series from an initial two in the 2018 line. In the Q70, Q80, Q90 and Q900 series, FALD enhances contrast, improves black-level control, and produces deeper blacks than edge-lit displays. Samsung hasn’t disclosed the number of FALD zones in its TVs, but Cohen boasted of superior anti-blooming technology that eliminates halos that appear around objects displayed on other brands’ FALD screens. “It’s not just about how many zones but how you use them,” Cohen said. FALD is not available in the Frame and Serif TVs. The RU7100 series consists of six models with screen sizes of 43 to 75 inches at prices from $429 to $1,599. The RU7300 series offers two curved-screen versions of the 7100’s 55- and 65-inch models at $699 and $999. The RU8100 Premium UHD series consists of five models in sizes from 49 inches to 82 inches at $799 to $3,199. Among the 4K QLED series, the Q60 series comes in six screen sizes from 43 to 82 inches at $799 to $3,799. Q70 consists of five sizes from 49 to 82 inches at $1,249 to $4,499. The Q80 features three models at 55 to 75 inches at prices of $1,999 to $3,999. And Q90 features three models at 65, 75 and 82 inches from $3,499 to $6,499. The 8K Q900 series currently features four models in 65-, 75-, 82- and 85-inch sizes at prices from $5,000 to $15,000. The launch of a wide selection of 8K TVs will encourage content creators to create native 8K content, said spokesman Lou Masses. For now, Samsung’s 8K TVs will upscale content to 8K using AI. As consumers opt for bigger and bigger TV screens, smaller and more densely packed pixels delivering higher resolution become more important, Cohen added. Samsung continues to eschew dynamic-metadata Dolby Vision HDR in its 4K and 8K sets but supports static-metadata HDR10 and Samsung-backed dynamic-metadata HDR10+. I am more excited about LG Signature OLED TV. I think they are releasing that on May.